I thought it was my CPU overclock failing, so I dialed it back. Did not help. It's not due to networking, as you can see in the example picture it happened even in Test Range. 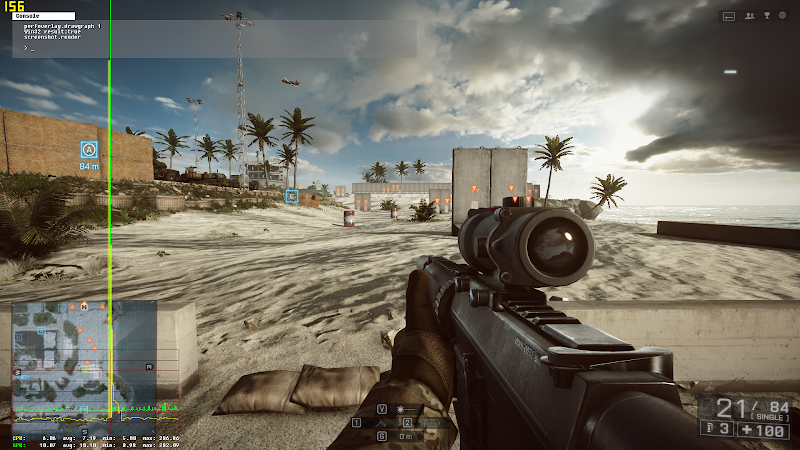 When it started happening it did not correspond to any BF4 patch nor graphics card driver releases. I tried rolling back my NVIDIA driver to the previous version anyways, and surprisingly enough it did not help. It did not happen to any other games I play, which admittedly at the moment is only a heavily modified version of Skyrim. I tried disabling all the Windows 7 "appearance" settings (back to Win95 look yo! ), and even closing my browser (Chrome) after the game starts. No good. From that tangent then I uninstalled FRAPS, which has not been updated for YEARS but nonetheless has always worked flawlessly. That fixed the issue. Maybe nowadays nobody is using FRAPS so it is not a widespread issue. At least I could not find anyone talking about it. This post is for me and that other guy, maybe a few more? I use NVIDIA and I don't know if GeForce Experience has an FPS counter. I can't use it anyways because it hates Skyrim Script Extender. Sorry to bother you, but this seems to be the only thread I can find about Fraps screen capture program problems. I have a question about it to ask you guys. Recently I recorded a Battle 1gameplay video with Fraps and later found it was too big, (the video length is just 10 minutes but the output is near 2G).So I downloaded this software as you can see --snip-- to help me compress Fraps videos. But after conversion, the original video file got converted into MP4 format andt hen I found there was a huge quality loss and the frame rate also dropped a lot. I want to know if you guys know any better parameter settings which can make it look good. lot. I want to know if you guys know any better parameter settings which can make it look good. Do not necro threads unless your topic is very on topic. Also I almost deleted your post as a spam due to suspicious link added. And as for your question: Fraps is obsolete and not too supported anymore. Move to use other recording software, e.g. Nvidia Shadowplay or Open Broadcast Software. Thread locked and link removed.